Today, the 12th of June, is day 12th of my 30 Day Yoga Challenge. I have done an hour yoga every day since the 1st of June. Today, however, I am not feeling well. Nauseous, headachy and generally a little run down. So, I have two choices, pretend like nothing and keep going as usual, or take it a little easy and listen to what my body is telling me. That is what they are teaching at yoga and that’s what we should be taught in life too. Listen to what your body has to tell you today. I went with choice two and decided not to bring my germs and bacteria (if I have any?) to the yoga studio and spread it to all the innocent people there. But, I wanted to do something, and luckily Barre Body has an online studio with stuff you can do at home (awesome!). So I did Glutes, Core and Stretch and Lengthen on my floor. At least I did a Something Every Day, that was suited to how I feel today. If you haven’t done anything yet today, I highly recommend checking out one or two of the videos. How about challenging your partner to the His and Her’s Burner Lunge? Love it! 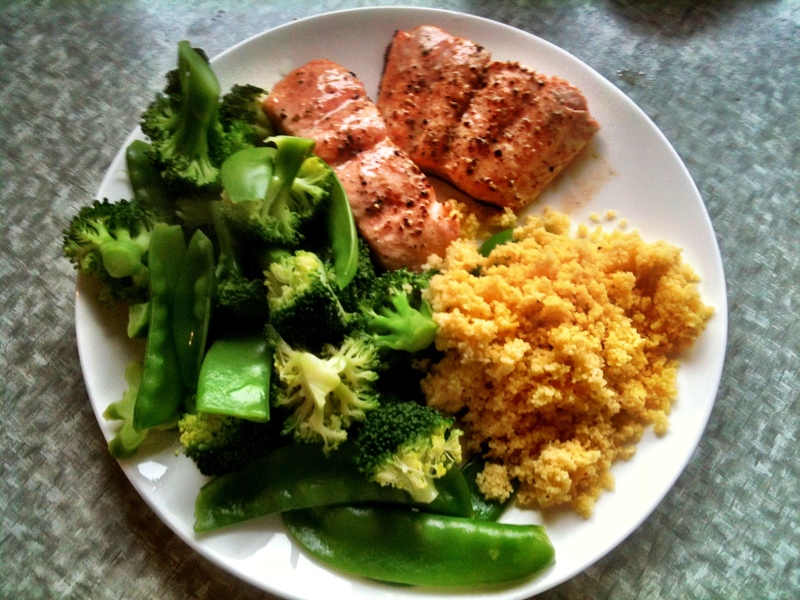 Salmon, broccoli, snow peas, couscous, moroccan spice mix (or any other vegetables you like/your kids like/your husband likes and any other spices you like in your couscous), salt and pepper and some butter for frying your fish. Put a little (I really mean a lot here) butter in a frying pan and melt, put salt and pepper on your fish and put your fillets in the frying pan, skin side down (high heat for a little while so the skins get crispy – yum!) and put a lid on it. Tell your kids to chop up the broccoli and wash and clean the snow peas (or any other favourite vegetable they have), while you boil some water in a kettle. Some is for steaming the vegetables, once your kids has finished labouring and some is for your couscous. Put a little water in a sauce pan (one you have a steamer unit for) and put it over the heat and put all your vegies in the steamer thingy and put a lid on it. Put equal amounts of couscous and boiling water in a bowl, put spices in, stir and cover with a lid. Check on your salmon – is it cooked through? If not, do 10 push ups, 10 squats and 10 lunges on each leg. Check again. If it’s cooked, take it off the heat. Check on the vegies and repeat the routine over if they’re not cooked. Now, stir the couscous to fluff it up, put it all on plates (remember daddy gets the most, because he is the biggest etc.). Enjoy! Tasty, healthy, homemade, natural, clean and all those other good things. If you don’t like couscous or it goes against your religion, may I suggest swapping it for rice, brown rice, sweet potato or more broccoli. If you think it’s to dry (don’t overcook your salmon!! ), melt some butter and pour over or put a dollop of sour cream on the side (neither will kill you – promise). Follow me on Instagram and Facebook to see what’s happening. This entry was posted in Recipe, Something Every Day, Yoga and tagged 30 Day Yoga Challenge, Barre Body, Dinner, listen to your body, Recipe, Salmon Recipe. Clean Eating, Yoga. Bookmark the permalink.